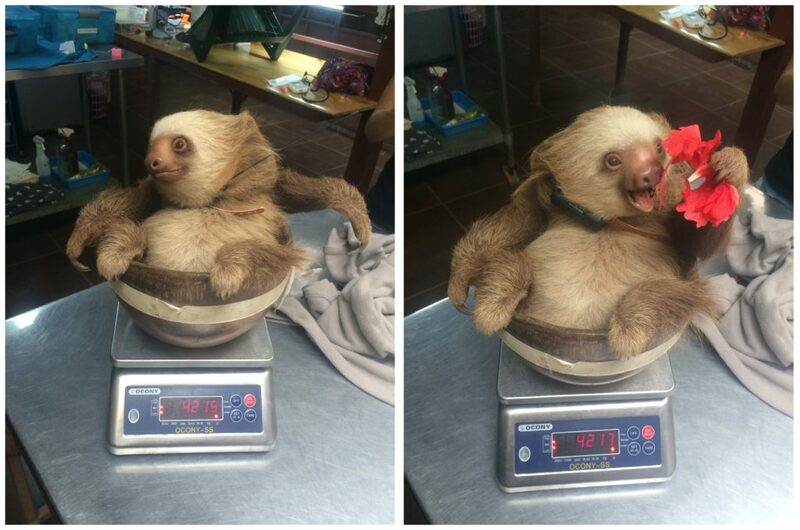 Can an orphan sloth that has been hand-reared in a rescue center survive after being released into the rainforest? As humans, can we raise that baby in a way that equips it with the survival skills necessary to safely navigate the treetops, find its own food and avoid predators? And what about the sloths internal immune-system defences: will these be strong enough after being raised in a sterile environment? There is only one way to find out, and so we are collaborating with the Jaguar Rescue Center to do exactly that! 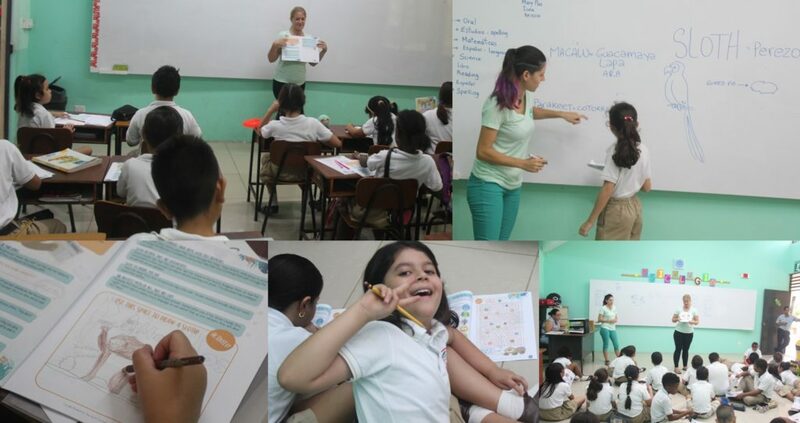 The rehabilitation and release of orphan sloths is of increasing importance in the conservation and management of the species. 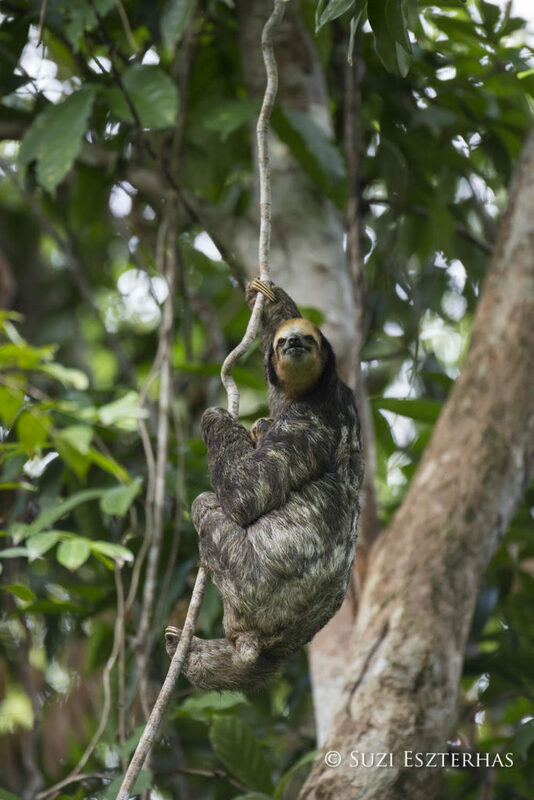 In recent years there has been a rapid increase in the number of sloths arriving at wildlife rescue facilities in Central and South America, and although the species is not globally threatened, they are now recognised to be of conservation concern in Costa Rica. 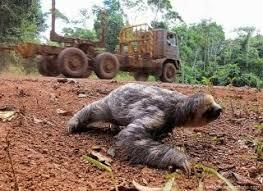 Sloths are requiring frequent rescue due to the loss or fragmentation of their habitat, disease, injury (often associated with traffic collisions, electrocutions or dog attacks), death of a mother with dependent young, or the necessity to relocate a sloth away from a dangerous location. 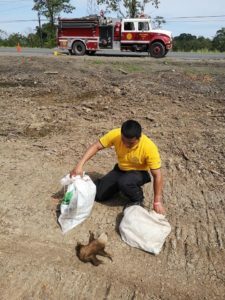 The primary aim of wildlife rehabilitation should always be to return each individual to the wild with maximum chances of survival whenever possible. A release is generally considered to be a success if the animal integrates into the wild breeding population and reproduces. The factors contributing to survival post-release are more complex for those sloths that have been orphaned and raised in captivity by humans compared to relocated or rehabilitated adults. 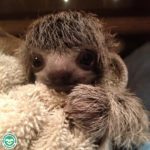 A baby sloth is thought to stay with the mother for a full 12 months, during which time it acquires the essential skills required to survive in the wild. While many aspects of the sloth’s behaviour may be innate, certain skills must be learned. One such skill is knowing which leaves are safe to eat and where to find them, and this is a crucial lesson that wildlife rehabilitators must overcome to ensure an orphan sloth survives post-release. To date no published studies have been carried out to determine the fate of rehabilitated, captive-reared or relocated sloths after release. Although sloths have been hand-reared and released into the wild by numerous organisations for over a decade, there has been no clear understanding of their fates because post-release monitoring with radio-telemetry has not been a common practice. This is due in part to the logistical problems associated with monitoring a cryptic arboreal species in a dense tropical rainforest, and also due to the financial burden of purchasing radio-telemetry equipment for rescue centres who receive no government funding. Consequently, there is much debate over whether hand-reared sloths can survive in the wild at all, with some institutions choosing to maintain orphan sloths as permanently captive animals to ensure their safety. 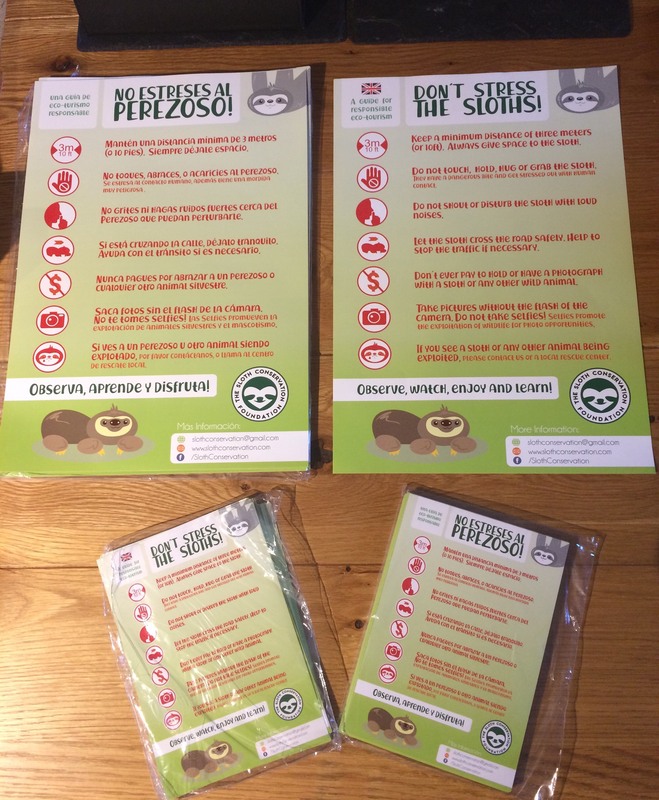 With the increase in sloths arriving at rescue centres and the rapidly growing conservation concern for the species, it is becoming imperative that a standard protocol is established which enables organisations to achieve the optimum welfare outcome for each individual, whatever that may be! For sloths that do not have any physical impairments, disease or genetic problems, the ultimate goal of all wildlife rescue facilities needs to be to return these individuals back to the wild with long-term post release monitoring. Post-release monitoring can be grouped into 3 broad data categories: survival, movement and behavioural data. While most release efforts that utilise radio-telemetry typically only monitor the length of time an animal can be located in the wild, this can often leave it difficult to determine whether an animal’s death was due to natural causes, or because the animal was not properly prepared for release. 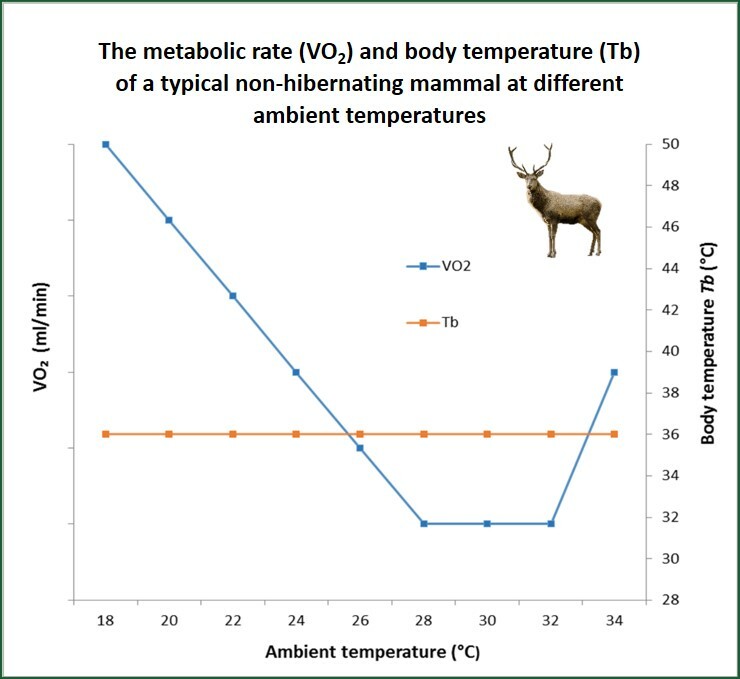 To effectively evaluate the success of a release protocol it is therefore important to combine data on the animal’s movement patterns and post-release behaviour with any changes in the overall physical condition of the animal and comparisons with similar data from wild populations. Here at SloCo we are incredibly excited be launching a long-term collaborative study to monitor and document the survival of radio-collared hand-reared sloths after being released from the Jaguar Rescue Center (JRC) in Costa Rica. The first 4 sloths scheduled for release were all rescued as tiny orphans (all weighing less than 600 grams) over 2 years ago and have now been equipped with VHF tracking collars and moved into the JRC’s state-of-the-art soft release enclosure. This jungle enclosure is built over 30 meters in the air and is ideal for getting the sloths used to being up high in the rainforest canopy. The doors are scheduled to open in May 2019, and we will be tracking and reporting on the progress of these sloths for the next 2 years! Sadly, hundreds of sloths every year fall victim to irresponsible tourism because people simply don’t realise the stress that they are causing. 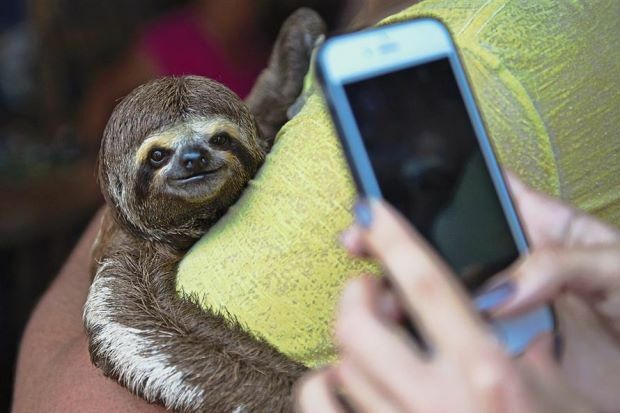 In Costa Rica sloths are regularly found low down or crawling across the ground between trees, and in excitement (or perhaps in an attempt to get the perfect selfie) people often crowd the animal, make a lot of noise and even reach out to touch the fur. This situation has been scientifically proven to cause a dangerous increase in the sloths heart rate and blood pressure, and can cause a female to lose or abandon her baby. In high tourist areas sloths are also commonly exhibited by the side of the road, with unsuspecting passers-by being charged to take a photo with the animal. 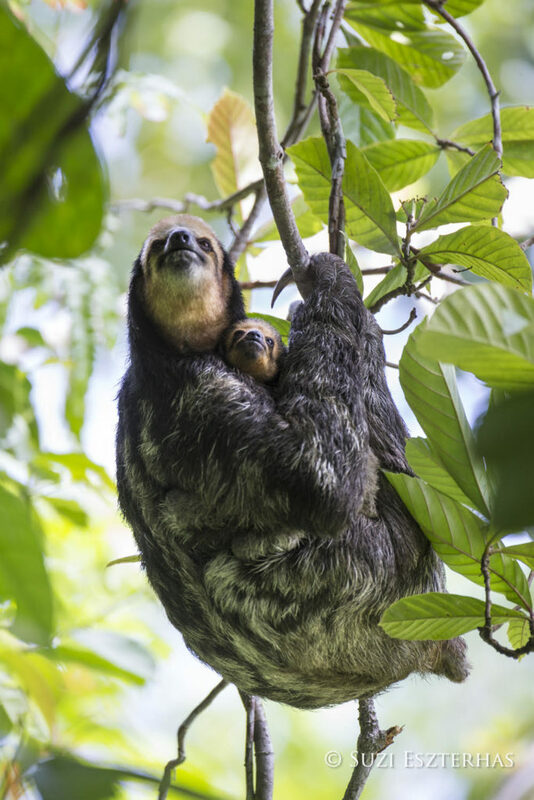 In reality, these sloths have been pulled from the trees, often the mother will be killed, and the baby used as a photo prop until it dies (or someone pays to rescue it). The sloth is then replaced in a vicious money-making cycle! We can stop this from happening by removing the demand through education and awareness! The world is waking up to the palm oil crisis that has driven orangutans to the brink of extinction, but is boycotting palm oil really the answer? Unfortunately no, but that doesn’t mean that we are powerless. Last week the UK supermarket chain Iceland shone the international spotlight on palm oil after its controversial Christmas TV advert was banned from British television. The advert, which depicts an orangutan hiding in a child’s bedroom after loggers destroyed his rainforest home, has now been watched over 30 million times online making it one of the most successful Christmas adverts ever created. Similar to the anti-plastic movement that is sweeping across the world, this advert has stimulated an uproar against the palm oil industry. While it has been overwhelmingly successful at raising awareness of a very important issue, fears are growing as increasing numbers of people are demanding a boycott on palm oil. This is dangerous. Palm oil is used in approximately 50% of everything that we buy, ranging from food and shoes to cosmetics and cleaning products. It is everywhere and the demand is huge. 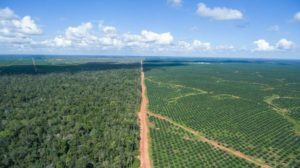 Consequently, palm oil plantations are responsible for the majority of Malaysian and Indonesian deforestation, with a football pitch-sized area of forest being cleared every 25 seconds in Indonesia alone! However this is not just an issue affecting Asia. Palm oil plantations are also springing up in place of the sloths rainforest habitat in South and Central America, further adding to the ecosystem destruction occurring due to crops such as soy, bananas and animal agriculture. Boycotting palm oil, however, doesn’t mean that manufactures will simply remove oil from their products all together. It simply means that they will be forced to replace it with a different kind of vegetable oil. Unfortunately, palm oil is already the worlds most productive oil crop. All alternative oils such as soybean and rapeseed require up to 10 times more land to produce the same amount of product – increasing demand on these crops would be even worse. In addition, boycotting palm oil will drive the price down, consequently increasing the demand for use in biofuel and livestock feed, particularly in countries such as China and India. Thankfully the answer applies to all aspects of consumerism, and will have benefits for species and habitats globally (including sloths! ): sustainable shopping. Think carefully about the products that you buy because as the consumer, you have the power. Only choose products from manufacturers and retailers who use ingredients from sustainable, certified, legal and deforestation-free sources. They exist, you just have to know which ones to look for! We know this sounds like a lot of hard work – who has time to read every label and search online for every product that you want to buy? But the good news is you don’t have to! There is a wonderful (and free!) bar-code scanning app called Giki that will do all of the hard work for you. Just scan the product that you want to buy and it will tell you all of the information you could ever want to know about that product. Whether it’s local pollution, global climate change, conservation, animal welfare or health, it will give you everything that you need to make an informed decision! Thankfully, using this app will also help you to avoid fruit and produce that is contributing to the sloth deformity epidemic in Costa Rica by way of rampant pesticide usage and forest fragmentation. It’s a win for everybody! 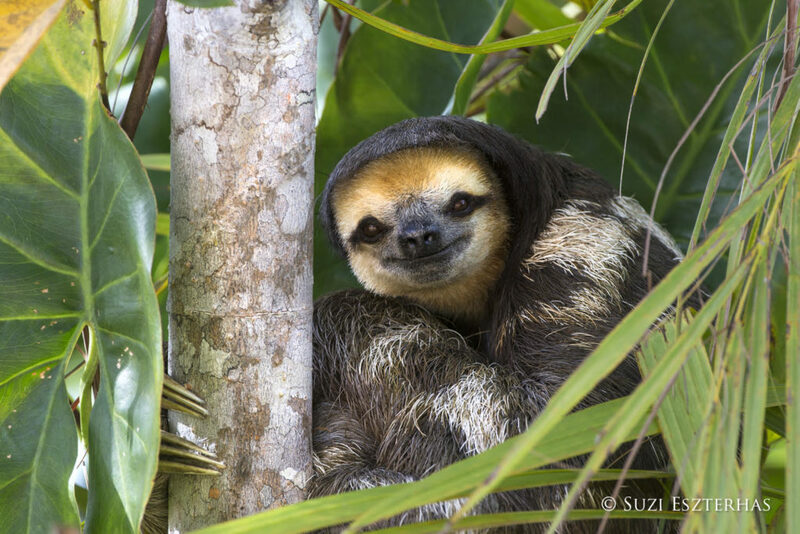 A long‐held presumption in ecology is that sloths get all the water they need from the foliage they consume, and few documented observations exist of either of the two sloth genera drinking in the wild. 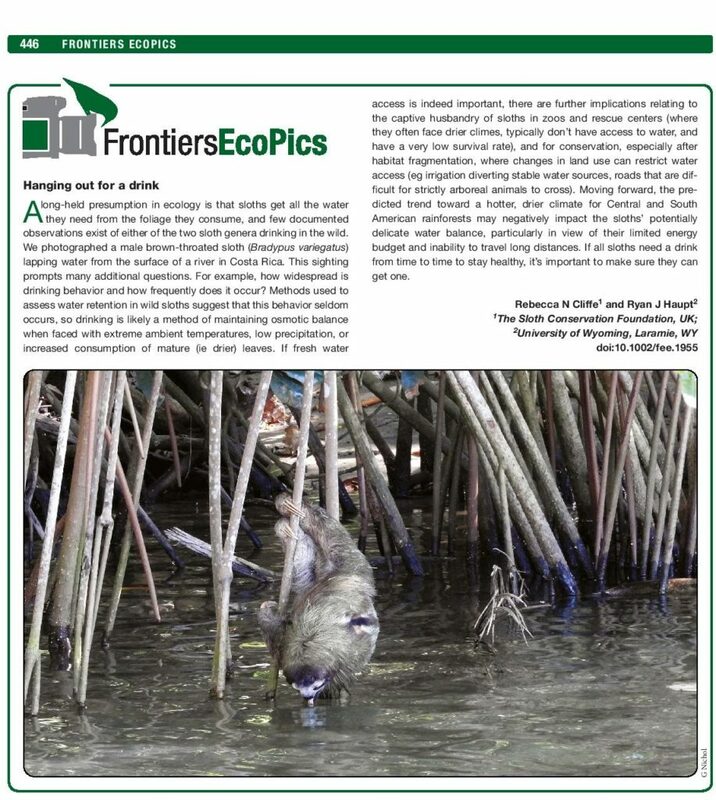 We photographed a male brown‐throated sloth (Bradypus variegatus) lapping water from the surface of a river in Costa Rica. This sighting prompts many additional questions. For example, how widespread is drinking behavior and how frequently does it occur? 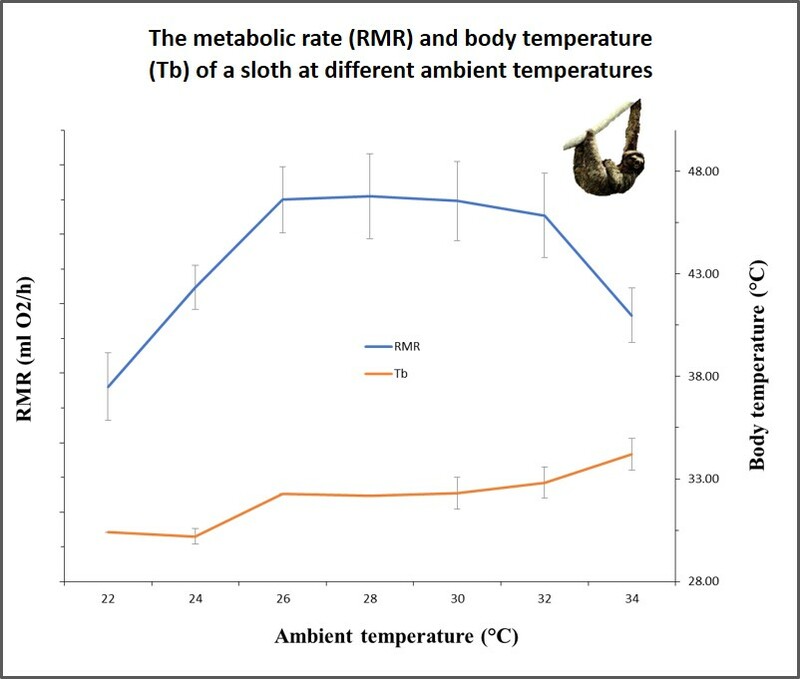 Methods used to assess water retention in wild sloths suggest that this behavior seldom occurs, so drinking is likely a method of maintaining osmotic balance when faced with extreme ambient temperatures, low precipitation, or increased consumption of mature (ie drier) leaves. If fresh water access is indeed important, there are further implications relating to the captive husbandry of sloths in zoos and rescue centers (where they often face drier climes, typically don’t have access to water, and have a very low survival rate), and for conservation, especially after habitat fragmentation, where changes in land use can restrict water access (eg irrigation diverting stable water sources, roads that are difficult for strictly arboreal animals to cross). Moving forward, the predicted trend toward a hotter, drier climate for Central and South American rainforests may negatively impact the sloths’ potentially delicate water balance, particularly in view of their limited energy budget and inability to travel long distances. 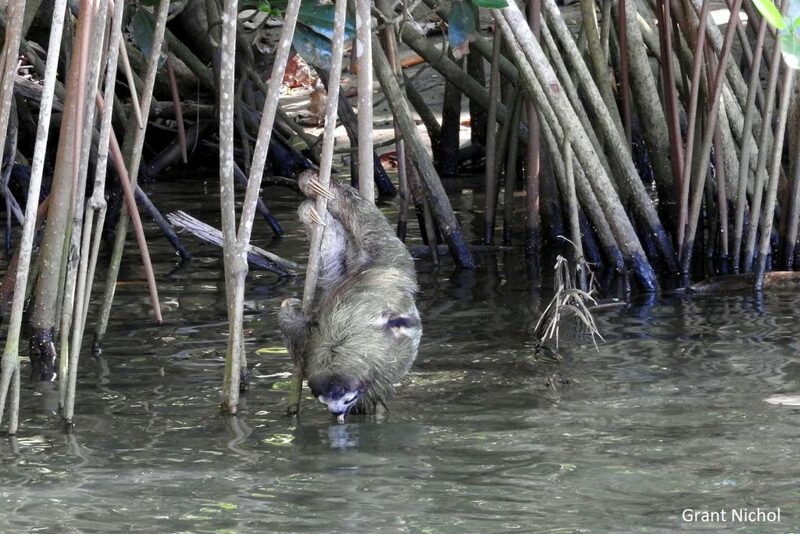 If all sloths need a drink from time to time to stay healthy, it’s important to make sure they can get one. 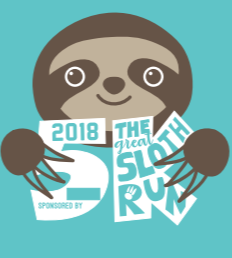 We are excited to announce that, together with Pangols and Sloth Relief & Shelters, we are launching the first ever 5K race to benefit sloth conservation – The Great Sloth Run! You can compete to win, or you can simply channel your inner sloth and go as slowly around the course as you like – as long as you make it to the finish line! Participants will receive a race T-shirt and a race medal, in addition to gifts from sponsors in the packet pick up. There will be prizes for first second and third place, in addition to a prize for the best sloth costume! The race is capped at 250 individuals so it’s probably best to sign up first and nap later! This 5K will be held in Arlington, Virginia on November 3rd. 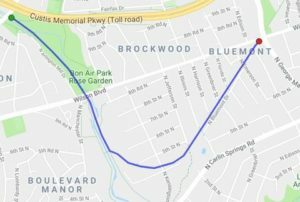 The race will begin at 11:30 AM at Bon Air Park and participants will run along a section of the Bluemont Trail. Don’t worry if you aren’t in the area, we also have a limited virtual option for up to 50 people where you will still be able to receive a medal and a T-shirt in return for your participation. However, if you are going for this option we do encourage you to sign up quickly as places are limited and you may not receive your goodies in time for the event. 1. If you would like to participate in the official run in Virginia, simply register here at Race Entry. 2. Virtual runners can purchase their participation package here. 3. Register to fundraise on Givebutter. 4. 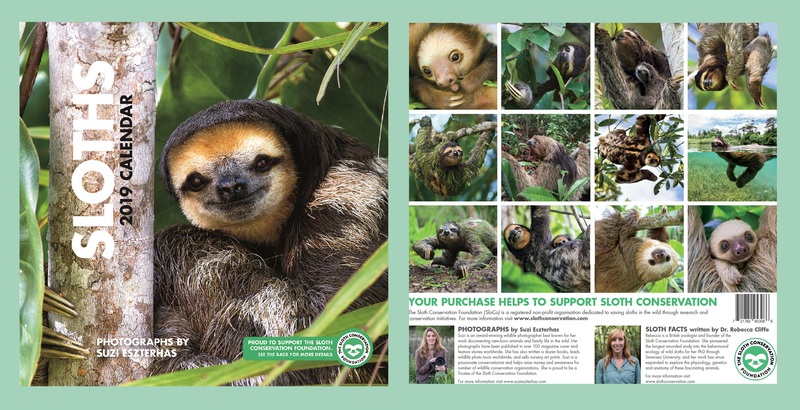 Start collecting donations – the more you fundraise for the sloths, the better! We are asking for people to try to raise $200 to start at the official event. 5. Check out the event page on the Pangols website! 6. Also, check out the Facebook event and reguster your attendance! Good luck and see you on November 3rd! Sloth Island, Guyana: in pursuit of the pale-throated sloth! Hiding deep within the remote jungles of South America, there is an elusive and commonly overlooked species of sloth clinging onto survival. The pale-throated sloths are perhaps the most striking of all the sloth species, with a large bright yellow face, white throat and mottled fur, and yet they also receive the least attention. While the maned sloths and pygmy sloths are famous for their critically endangered conservation status, and the brown-throated sloths are the most commonly seen species, the pale-throated sloths have slipped under the radar for decades. They have also bypassed the attention of the scientific community, with not a single scientist currently researching any aspect of their ecology or behaviour. 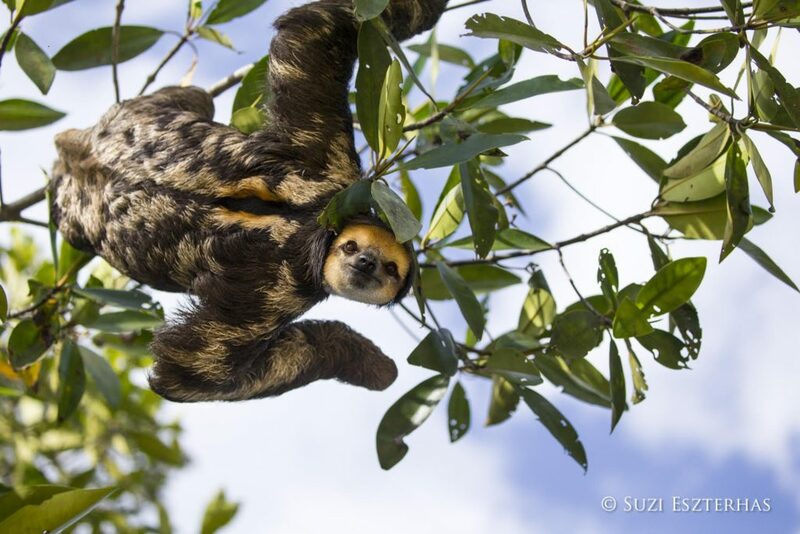 With this in mind, SloCo Founder and Executive Director Dr Rebecca Cliffe and award-winning wildlife photographer Suzi Eszterhas embarked on a mission to locate and photograph the pale-throated sloths in order to shine a spotlight on the plight of this mysterious species. The first big challenge when planning this adventure was deciding where to go to find the sloths. This species can only be found on the east coast of South America, ranging from Venezuela through Guyana, Suriname, French Guyana and into Northern Brazil. These regions receive very little tourism, and so finding an area where the sloths can be found reliably in the wild in relatively high densities (and not just at the tops of the tallest rainforest trees where photographs become impossible) was certainly challenging. After doing a lot of research, everyone that we spoke to unanimously directed us to the same place; Sloth Island in Guyana. 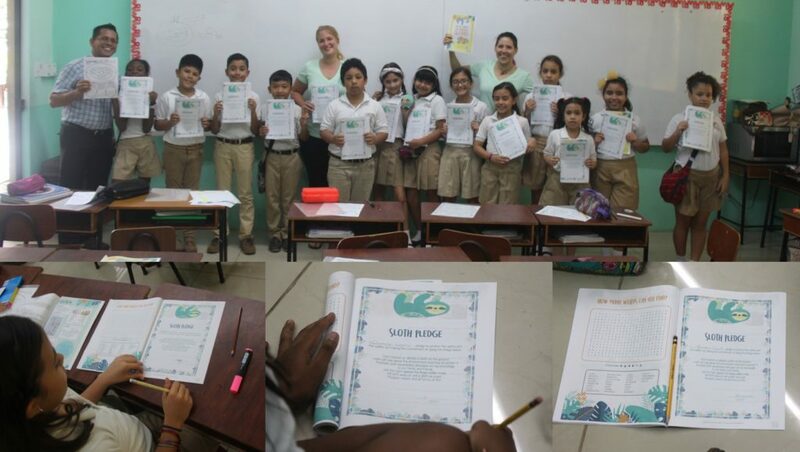 This appropriately named island is located in the vast Essequibo river (the 3rd largest river in South America) and was named by early Guyanan settlers who discovered that it was home to a particularly impressive abundance of sloths. The island is now privately owned by a fascinating man called Raphael who has constructed an idyllic Eco-lodge and vowed to protect the pristine rainforest that covers the interior of the island. Before our arrival at the lodge we were told that we would be met by a Guyanan man from the ‘Macushi’ tribe called Claude, who is the caretaker of the island and apparently a master sloth-spotter. Claude did not disappoint. Within 30 seconds of landing on the island he had already pointed out our first sloth; a young male sleeping in a tree right outside the front door of the lodge. It was a good sign of things to come. The male sloth remained in the garden of the lodge for a full week, regularly coming down to within a few meters of the ground in the afternoons to seek out shade from the scorching sun – a perfect position for photographs! Because much of the island floods at high tide, much of our sloth searching in the dense forest was restricted to a wooden canopy walkway, raised about 6 feet off the ground. This didn’t hamper our sloth spotting opportunities however, as Claude proceeded to point out 13 different sloths over the course of 5 days, including two females carrying tiny babies. One of these females blessed us with her presence every single day, hanging out peacefully right above the walkway and descending to just above head height to feed on vines in the afternoons. This unfortunately always coincided with the aforementioned male sloth (who also descended from the canopy in the afternoons) and triggered a lot of chaotic sprinting back and forwards through the jungle carrying heavy camera equipment! 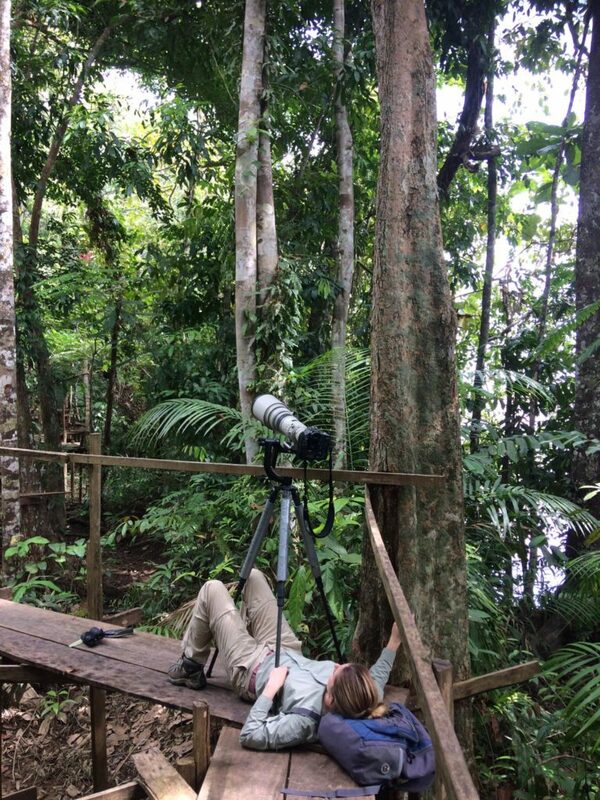 We thought that our biggest challenge would be finding the sloths, but it actually turned out to be choosing which sloth to prioritise and getting the camera set up in the right place to catch the rapidly unfolding action (really quite ridiculous considering we were working with the worlds slowest mammal)! In one instance we were following a female sloth with a baby and didn’t realise that there was a second male sloth hanging out in the exact same tree until she quite literally climbed right up to him. Sloth Island really did live up to its name. Exactly why there are so many sloths on the island compared to the mainland remains a bit of a mystery, although it is likely that the island represents a sort of safe haven due to a lack of land predators (although the breath-taking harpy eagle – one of the largest species of eagle in the world and the sloths main predator – can regularly be seen scouring the skies around the island)! 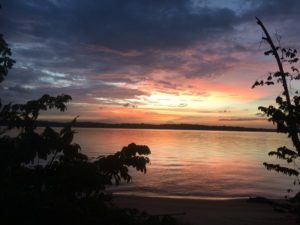 Though the island is famous for its sloths, we were regularly surrounded by all sorts of wildlife – from waking up to the sounds of howler monkeys and dodging piranhas in the river to watching spider monkeys leap through the canopy and ending the day with thousands of Amazonian parrots filling the sky. Guyana represents one of the few remaining areas of the world where nature dominates over human disturbance. With a human population of only 750,000 (virtually all of which live on a narrow strip of land by the ocean) and very little tourism, this means that over 80% of the country is still covered in undisturbed rainforest. Guyana really is an undiscovered and unparalleled paradise for nature lovers. To top it all off, a historic agreement made between Norway and Guyana represents a perfect example of how developed and developing countries can work in partnership to save the worlds tropical forests. Norway pledged to provide financial support of $250 million in exchange for Guyana halting deforestation over a 5-year period. While tourists flock in their thousands to countries like Costa Rica (which has a primary forest cover of only 3.5%) to see sloths and other tropical wildlife, the truly wild countries like Guyana remain well off the beaten track. If you are planning a vacation and want to see sloths in the wild, or just want to embrace your wild side and experience the jungle exactly how nature intended it, there is no better place than Sloth Island in Guyana! To learn more about Sloth Island and to book your visit, check out their website by clicking here.